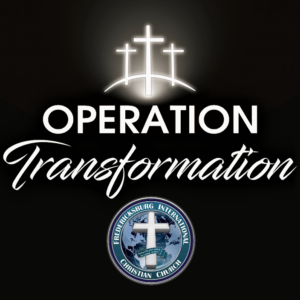 Operation Transformation was started roughly a year ago, spearheaded by Pastor Mark Dunn. Based on the Biblical mandate to make disciples and to transform lives, Operation Transformation seeks to ignite the fire in a Christian’s life to share the Gospel of Salvation to the world! Go ye therefore, and teach all nations [Evangelize], baptizing them in the name of the Father, and of the Son, and the Holy Ghost: [Edify]. Teaching then to observe all things whatsoever I have commanded you: [Educate] and, lo, I am with you always, even unto the end of the world [Exalt]. Evangelize, Edify, Educate, and Exalt, these are the four fundamental ministries derived from this Scripture, and dubbed as the “E-teams”. Operation Transformation is based on an “Every Member A Minister” strategy. In which, an effective church means every member has a ministry and a function within the church. As part of this goal, Operation Transformation seeks to identify the “spiritual gifts” of each member. And then to hone and develop these wonderful God-given spiritual gifts. Enabling the member to utilize these gifts with the sole purpose of sharing the Gospel to the world! But speaking the truth in love, may grow up into him in all things, which is the head, even Christ: From whom the whole body fitly joined together and compacted by that which every joint supplieth, according to the effectual working in the measure of every part, maketh increase of the body unto the edifying of itself in love. The ultimate goal of Operation Transformation is to focus on our Biblical mandate found in Matthew 28:19-20: to make disciples who makes a difference in this world! To enable FICC become an effective church–A CHURCH THAT TRULY MAKES A DIFFERENCE! A church that will make a difference in our families, in our church family, in our communities, and beyond! The Christian and the church exist to MAKE A DIFFERENCE, to be salt and light in this dark world! It is our Mandate to Make Disciples and to Transform Lives.